God’s great miracles through Moses filled Egypt with undeniable evidence for the God of Israel (Ex. 9:27). Yet neither the Bible nor history records Egyptian repentance, only good riddance (Ps. 105:38; Ex. 12:35-36; 14:25). Further and more dramatic, consider the effect of those tremendous miracles on Israel. God followed the 10 plagues (Ex. 7:14-12:30) done on behalf of Israel with the parting of the Red Sea (Ex. 14:21-22) and the drowning of the Egyptian army (Ex. 14:26-28). Then daily for 40 years God appeared to the entire nation as a column of smoke by day and a pillar of fire by night (Ex. 13:21-22; Num. 14:14; Neh. 9:12; Ps. 105:39). The Lord kept their clothes from wearing out (Deut. 8:4), produced water out of the Rock (Ex. 17:2-6), fed the people with angels food from heaven (Ex. 16:4-7) and brought meat on demand, literally filling their camp with quail (Num. 11:31-32; Ps. 105:40). Jesus did great miracles and crowds followed Him, but mostly out of selfishness. Of thousands who received His miracles, few worshiped Him. Of 10 lepers healed, only one even said thanks (Luke 17:17). Generally, Christ’s miracles did not win over the crowds (Mat. 8:34; 11:20; 13:58; Mark 15:8-15; Luke 4:23-28; 8:37; 17:17; John 5:8-10; 10:25-39; 12:29-30). Even His own city rejected the miracle-working Messiah (Mark 6:4-6). Norman: No, there’s some leftovers. Jack: You’re wrong, it’s all gone. Jack: Nope. We finished it. Jack: Did too. I saw mom put the rest in the garbage disposal. Norman: Do you like being wrong? Jack: I’m not wrong. You’re wrong. Norman: All right, I’ll just go in there and prove it. Norman comes out of the house with a serving bowl half filled with leftover spaghetti. He shows it to his brother. Question: Is Jack happy that he now knows the truth? Answer: No. Actually, Jack is angry. Why? Norman proved him wrong! People do not like the truth shoved into their faces. Jack may now know that there is leftover spaghetti but he resents his brother for proving the point. These boys quarreled over a minor issue. What is the reaction when the issue becomes more significant? Often the more serious the issue, the more a man resents those who prove him wrong. Evangelism sees the ultimate application of this principle. He who rejects God is not typically eager for correction. When someone’s heart is hardened against God, a miracle shoves the truth in his face. His mind cannot deny God but his heart can resist. Thus countless witnesses of the miraculous have refused to acquiesce. In which three cities did Jesus perform most of His miracles and what was the corporate response of those cities to His works? The Lord did many miracles in Jerusalem and it’s suburbs. Yet even in Jerusalem the crowds were not won over. For good reasons God determined to provide signs and wonders for and through Israel. Yet even He tired of their demand for service. It’s like bratty kids who want more and more, and no matter how much a parent does for them, they just demand more. It gets so that the parent is restrained from doing the good he would have wanted to do, because of the emotional weakness and immaturity of his children. The parent, for the child’s own good, wants the child to love him, not for gifts but for himself. The rich kid expects special treatment. The rules should not apply to him. But his wise earthly father, though he has wealth and power, does not comply. How much more will God, our heavenly Father, encourage His children to live by the rules, without special exceptions? What happens if the rich kid has an imprudent father? His son wants special treatment and gets it. The rules are bent for him, over and over and over. He does not learn the lesson of his failures here on earth. He is shielded from the consequences of his actions. Obviously this hurts the son, but what of the onlookers? What do neighbors think of the powerful dad who pulls strings so his kid gets away with things other kids cannot get away with? What do schoolmates think of the rich kid’s privilege? Does it warm their hearts? Are they drawn to respect dad and admire the son? 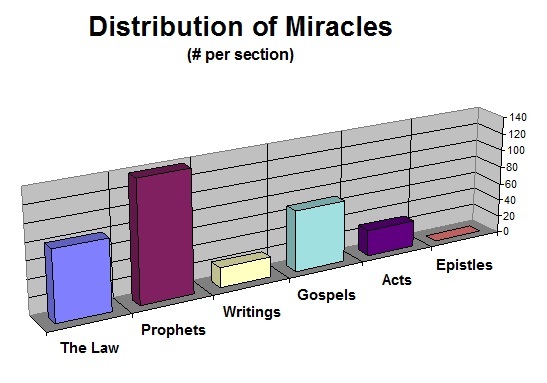 Why do the Epistles have a scarcity of miracles? God miraculously healed every sick person introduced in the Gospels and Acts, but none in the Epistles. For example, Paul’s said, “Trophimus I have left in Miletus sick.” (2 Tim. 4:20). The Epistles tell of no specific miracles. Paul knew of Timothy’s continuing health problems. This means that Paul himself did not heal Timothy of this persistent problem. Further, of course, neither could Timothy nor any of the believers around him heal this ailment. Moreover, Paul does not even instruct Timothy to seek deliverance by praying for healing or anointing with oil. Notice that Christians who pray for God to miraculously fix their cars only pray for repairs they cannot see with their eyes. If a car does not start, some believers will ask God to fix it rather than asking Him for wisdom in the situation. However, believers never ever pray for a repair of something visibly wrong with the car. For example, Christians never pray and ask God to supernaturally fix a flat tire. Why? If a knob is broken off or a windshield is busted out, Christians do not ask God to fix those things. Why? Because they know, deep within, even if they have a hard time admitting it, that God will not fix those things no matter how much faith they have. However, a mechanical problem that they cannot see presents a blind faith opportunity to deceive themselves. The uncertainty that goes with hidden problems leaves enough chance that the car just might start on the next attempt (as cars so often do). So, Christians claim a miracle when the car starts on the next try. Christians should admit that they do not possess the physical redemption of their earthly bodies. For if they did possess that redemption, then they would not long for it. So remember to glorify God in trials and difficulties because that is when His power will shine brightest. You may want to read Bob’s best-selling book, The Plot or listen to Bob teach through The Plot. Chapter 10 of this work provides a visual analysis of the 343 miracles in Scripture and the book gives an overview of the entire Bible. So you can get The Plot online or by calling 1-800-8Enyart and online you can see more of Bob Enyart’s Bible resources or write to us at BEL, PO Box 583, Arvada, CO 80001.